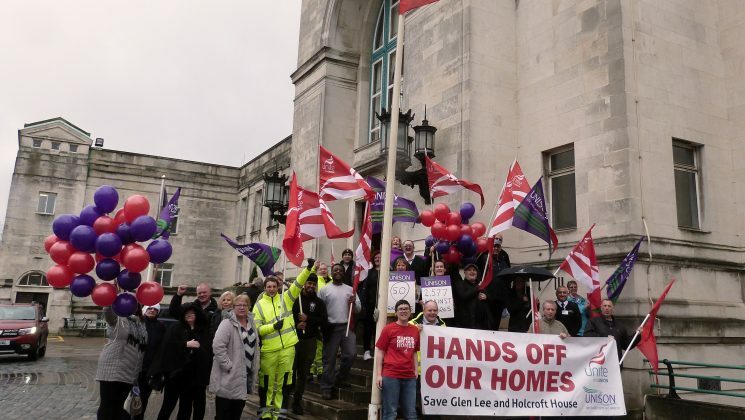 UNISON and Unite activists celebrated the submission of the Hands off our Homes petition with a powerful photograph highlighting the scale of the public response. Activists from UNISON and Unite the Union posed for the striking image on the Civic Centre steps, with each balloon representing 50 signatures. The success is all thanks to a dedicated team of activists that includes friends and family of residents, members of both unions, and the general public. The unions are considering the campaign – now entering its fifth month – to be a phenomenal success. The unions believe that the strength of public feeling against the proposed closures is so strong that that Cabinet will have no choice but to take the closure proposals off the table when they go to full Council for a final vote on 20th February. The number of signatures on the petition shows that the wider community stands in solidarity with those who would experience the direct impact of the closures. The petition has given the community an opportunity to put on record that they want the Council to re-consider and offer an alternative option, something UNISON and Unite repeatedly called for before the public consultation was formally opened. We hope the voice of the community will not be ignored by the Council when it makes its decision on the future of Glen Lee and Holcroft House.